The (Teddy) Boys are back in Town. 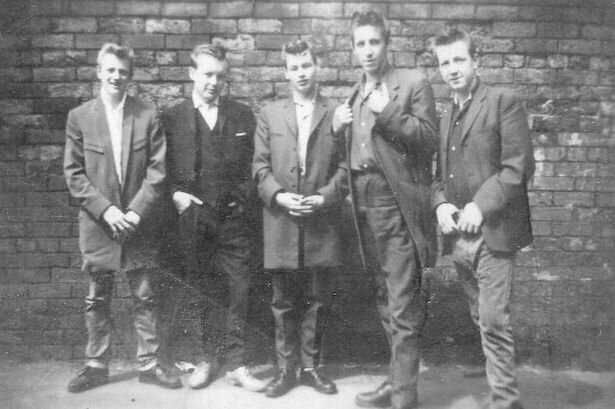 Teddy Boys from The Manchester Peacock Society including Stephen Mellor Steve Lyons, Frank Cunningham and Tony Cross. Mention Teddy Boys and some think of sharp suits, flick knives and rioting youths slashing cinema seats in the 1950s. Others think of rock 'n' roll revivalists Showaddywaddy in the 1970s - cartoon Teds in long drape suits of eye-watering hue. But look for the Teddy Boy of 2013 and you find him in burgeoning social groups like the Manchester Peacock Society - snappy dressers ranging in age from 18 to 70-plus, united by their love of Edwardian-style clothing and rock 'n' roll. "There are Teddy Boys all over the UK now. There's been a Teddy Boy revival on the way for the last two years," says Urmston-born Julian Lord, co-author of newly-published Teddy Boys: A Concise History. Ordsall Teddy Boys from Salford, Lancashire - photograph taken in 1958/9 from the book TEDDY BOYS A Concise History. Copyright: Paul Ramsbottom / Julian Lord. It's a timely history, for this year marks the 60th anniversary of the first mention of that term 'Teddy Boy' in a British newspaper. 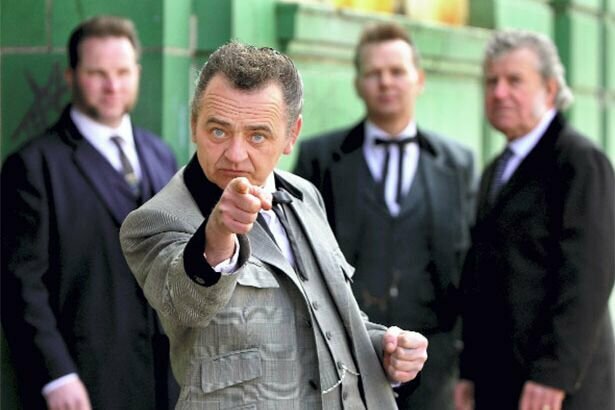 Lord and co-author Ray Ferris, argues that the significance of the Teddy Boys is that they were the very first teenage youth cult of the mass media age. "Being the first, there were no pointers, no guides. They wrote rules as they went along," says Lord, a 54-year-old former civil servant who lives in Knutsford. "Later subcultures could always look back to the Teddy Boys." Common wisdom had it that Teddy Boys were young hooligans inflamed by American rock 'n' roll. The swaggering Teddy Boy represented rebellion - post-war Britain's enemy within. The truth was not so simple, according to Ferris and Lord. For a start, the Teddy Boy pre-dated rock 'n' roll by four or five years. In 1948, London fashion houses began producing New Edwardian clothes - harking back to a time before the First World War - for middle and upper class customers wanting to swim against the tide of American influence. But working class men then adopted this look, mixed it with some American informality and strutted their new style like peacocks. The first Teds danced not to rock 'n' roll but big band music from the likes of Ted Heath and Count Basie. 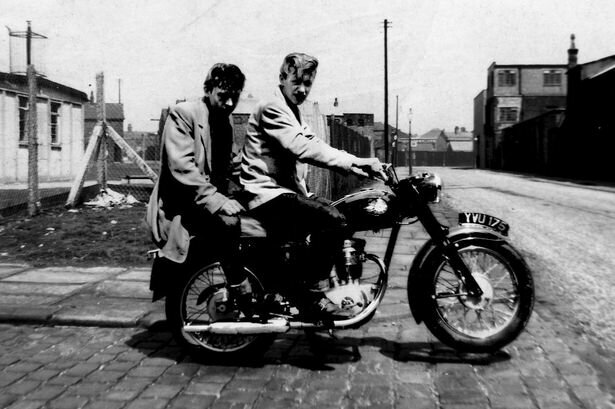 Mancunian Dennis Burnier Smith astride a motorcycle with a pal in 1959. Like many British Teds, Smith idolised the singer, Gene Vincent and his style of Rock 'n' Roll music. Some recall a 1951 gig by boogie woogie pianist Sugar Chile Robinson at Ardwick Hippodrome, at which many in the audience already wore the Ted look of tight trousers, long jackets, brothel-creeper shoes and quiffs inspired by actor Tony Curtis. By 1953, the dangerous reputation of the Teddy Boy was fed by reports of a gang fight in London in which a teenager was stabbed to death. In 1955, Teds greeted the movie Blackboard Jungle - with its opening soundtrack of Bill Haley's Rock Around The Clock - by destroying cinemas. A thousand teenagers rioted at the Gaiety in Manchester at a showing of the film, which was eventually banned from cinemas across the country. Teds were coming to be seen as a threat to the nation's moral fabric. Brian 'Rockin' Lewis' Stuart, aged 71, became a Ted in the '50s and tells in the book of a huge gang fight with Liverpool Teds at Belle Vue amusement park, and another occasion when he and other Teds set about American servicemen from Burtonwood air base, who were in Levenshulme "trying to pinch our girls". Some of the founder members of the Salford Bop Cats in 1975. 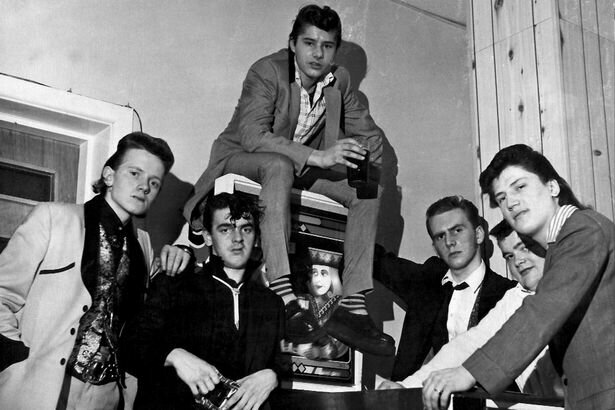 From left to right: the late 'Tapper' Tetlow, 'Corbo' Corbett, Ray Ferris (at top of Pin Ball Machine), David Gene Vincent, Dave Machin and Paul 'Rambo' Ramsbottom. The Teds waned in the 1960s, but then enjoyed a revival in the 1970s, winning new recruits such as Julian Lord, who was aged 20 when he first visited the Midland pub in West Didsbury. "There was a line of people in Edwardian clothing and ladies in circle skirts, and they went through a small doorway which opened up into this large room," he recalls. "The DJ was playing '50s music and everybody was bouncing around appearing to have the most wonderful time. "There were rumbles. It was part of the lifestyle. There were other young people about you who were not Teddy Boys - we called them squares or smoothies; they were just in the fashion of the day - and there would be calling of the Teddy Boy style in order to provoke nastiness." And so Teds battled with other youth cults and with rival gangs of Teds. But by the '80s, many of the youth tribes - Teds, skinheads, mods, rockers, punks and the rest - were dwindling. "It wasn't the music that caused them to be Teddy Boys in the '50s; it was a much wider social phenomenon," says Lord. "And the revival in the '70s was still based on the original premise of being different." After the garish drape suits of the '70s, surviving Teds went back to more muted apparel. "By 1983, my suits were all black," says Lord. "It returned to the suave, sophisticated look it began with." When the Manchester Peacock Society was formed in 2010, the aim was to recreate the original Teddy Boy look from the 1950s. The society now numbers over 30 Teds - originals from the '50s, second wave Teds from the '70s and young new recruits. "Ian Dury had that song Sweet Gene Vincent, which said 'There's one in every town'," says Lord. "That song was accurate. It's an enduring phenomenon with two big revivals." Teddy Boys: A Concise History by Ray Ferris and Julian Lord is published by Milo at £6.99.